When I was growing up I loved Thomas’ English muffins. Toasted, slathered in butter & jam they were pretty close to the perfect food. In a more savory application my mother used to make what we called “pizza burgers” : toasted muffins with pizza sauce, mozzarella cheese and pepperoni, broiled to bubbly deliciousness. And don’t even get me started on those sinful Egg McMuffins. Unfortunately as I got older my digestive tolerance of english muffins became problematic. I don’t really know the hows or whys of it, but they became one of those foods that I began avoiding because they caused me heartburn. Every. Single. Time. 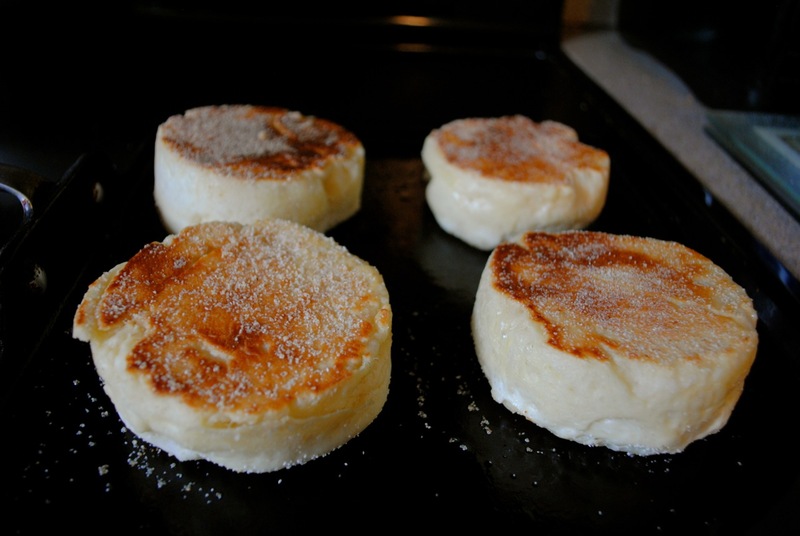 It took me awhile, then, to hop on the “homemade English Muffins” bandwagon. I’d been seeing the rings used to make them advertised on the King Arthur Flour website, along with the recipe to make them. There were rave reviews. But I hesitated. It was Emily that convinced me to take the leap. 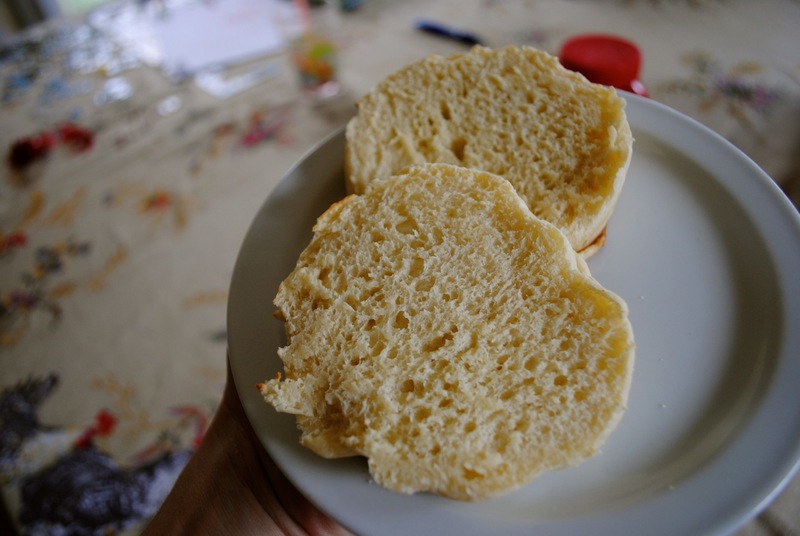 She has been loving my pain de mie and homemade jams for breakfast, and gets awfully cranky when there is no bread. In an effort to come up with an alternative I decided she’d probably love the muffins. I ordered the rings and got to it ($11 for a set of 8 – not a bad deal!). And you know what? They were a snap to make. I used the King Arthur Flour recipe since it seemed to be the simplest. They also have a honey – wheat variation that you KNOW I’ll be trying. These come out big and thick and lovely. I had planned on making them to put aside for breakfasts, but while they were cooking I realized I had the makings of dinner: eggs, ham, cheese. 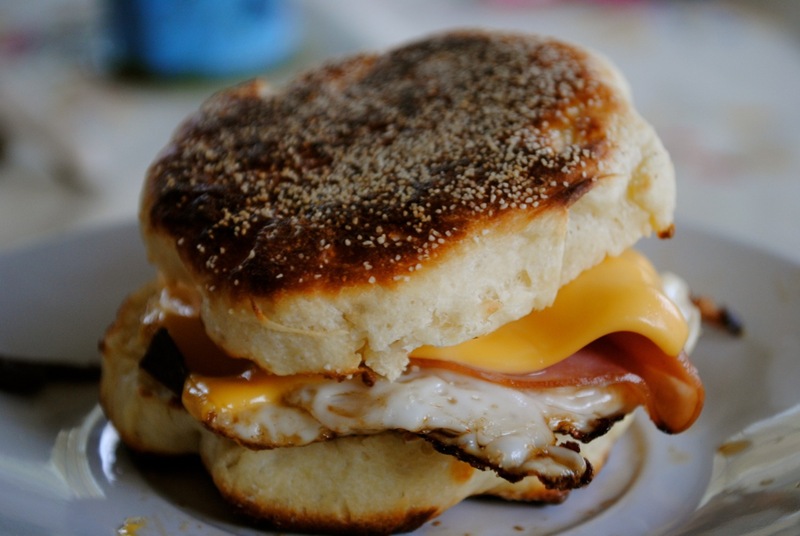 When I cut open the first one and knew I had success, I assembled the fried egg, ham, and melted cheese sandwiches for a tasty dinner. They were far better than any fast food sandwich you can get. Dinner was accompanied by pleasant moans of happiness from my children: and that’s quite a feat, let me tell you. The best news? No heartburn. 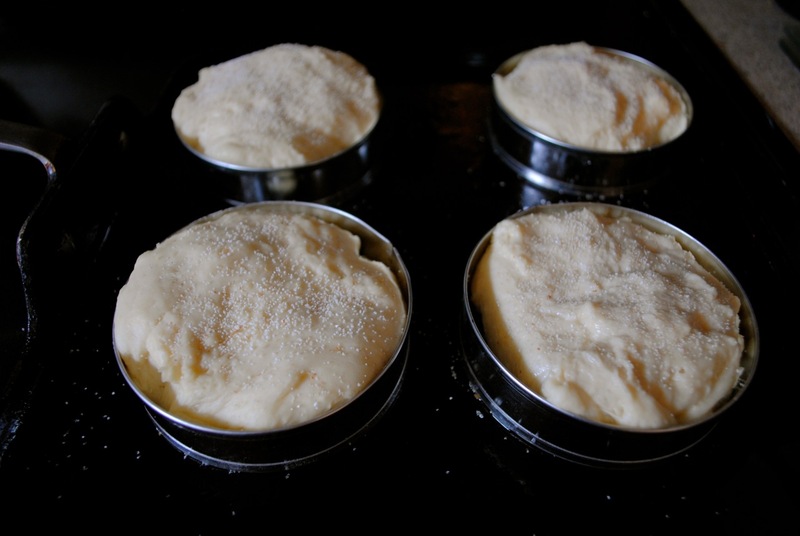 The true test will be when I have one with butter & jam, but I am feeling optimistic. I, too, get heartburn from most English muffins! I have never been able to figure out why. Is there something different fa out the yeast? Is it the nooks and crannies? I have only found one local bakery where I live (in northern California) that makes EM’s that don’t cause me heartburn. Now I wil have to try this recipe as well. Thanks for sharing.